Juhyo, a.k.a. 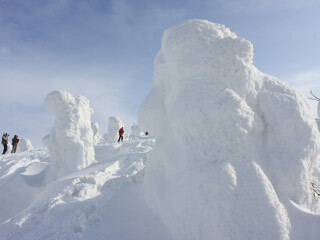 Ice Monster or Snow Monster, is one of the most popular phenomena in Japanese winter. It only appears in very few mountains in the world. Mt. Zao is one of the popular Juhyo spot in Japan. On the top of Mt. Jizo(1736m), that is one of the Zao mountains, Juhyo is formed with the cold and wet wind from Siberia. From the end of December Juhyo slowly grows up and in the February the entire summit of the mountain will be covered with this Ice Monsters. There are few conditions that Juhyo is able to grow. When extremely cold water and snow brow strongly from the same direction in certain temperature. If it's too warm, ice will melt. If it's too cold, ice will not stay at the trees. When the wind from Siberia goes through the sea of Japan, it contains a lot of water. When that wind hit the mountain of Zao, the water becomes super cold water. This water and snow mixed at this place and grows Juhyo.